Mount McKinley has a larger bulk and rise than Mount Everest. Even though the summit of Everest is about 9,000 feet (2,700 m) higher as measured from sea level, its base sits on the Tibetan Plateau at about 17,000 feet (5,200 m), giving it a real vertical rise of little more than 12,000 feet (3,700 m). The base of Mount McKinley is roughly a 2,000-foot plateau, giving it an actual rise of 18,000 feet (5,500 m). 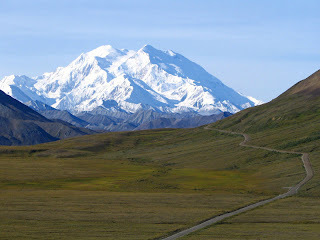 Mount McKinley has two significant summits: the South Summit is the higher one, while the North Summit has an elevation of 19,470 feet (5,934 m) and a prominence of approximately 1,320 feet (402 m). The North Summit is sometimes counted as a separate peak (see e.g., the List of United States fourteeners) and sometimes not; it is rarely climbed, except by those doing routes on the north side of the massif. Five large glaciers flow off the slopes of the mountain. The Peters Glacier lies on the northwest side of the massif, while the Muldrow Glacier falls from its northeast slopes. Just to the east of the Muldrow, and abutting the eastern side of the massif, is the Traleika Glacier. The Ruth Glacier lies to the southeast of the mountain, and the Kahiltna Glacier leads up to the southwest side of the mountain. The first recorded attempt to climb Mount McKinley was by Judge James Wickersham in 1903, via the Peters Glacier and the North Face, now known as the Wickersham Wall. This route has tremendous avalanche danger and was not successfully climbed until 1963. Famed explorer Dr. Frederick Cook claimed the first ascent of the mountain in 1906. His claim was regarded with some suspicion from the start, but was also widely believed. It was later proved fraudulent, with some crucial evidence provided by Bradford Washburn when he was sketched on a lower peak. In 1910, four locals (Tom Lloyd, Peter Anderson, Billy Taylor, and Charles McGonagall), known as the Sourdough expedition, attempted McKinley, despite a complete lack of climbing experience. They spent approximately three months on the mountain. However, their purported summit day was impressive: carrying a bag of doughnuts, a thermos of cocoa each and a 14-foot (4.2 m) spruce pole, two of them reached the North Summit, lower of the two, and erected the pole near the top. According to them, they took a total of 18 hours — a record that has yet to be breached (as of 2006). No one believed their success (partly due to false claims that they had climbed both summits) until the true first ascent, in 1913. The first ascent of the main summit of McKinley came on June 7, 1913 by a party led by Hudson Stuck. The first man to reach the summit was Walter Harper, an Alaska Native. Harry Karstens and Robert Tatum also made the summit. Tatum later commented, "The view from the top of Mount McKinley is like looking out the windows of Heaven!" They ascended the Muldrow Glacier route pioneered by the earlier expeditions, which is still often climbed today. Stuck confirmed, via binoculars, the presence of a large pole near the North Summit; this report confirmed the Sourdough ascent, and today it is widely believed that the Sourdoughs did succeed on the North Summit. However, the pole was never seen before or since, so there is still some doubt. Stuck also discovered that the Parker-Browne party were only about 200 feet (61 m) of elevation short of the true summit when they turned back. See the timeline below for more important events in Mount McKinley's climbing history. The mountain is regularly climbed today, with just over 50% of the expeditions successful, although it is still a dangerous undertaking. By 2003, the mountain had claimed the lives of nearly 100 mountaineers. The vast majority of climbers use the West Buttress Route, pioneered in 1951 by Bradford Washburn, after an extensive aerial photographic analysis of the mountain. Climbers typically take two to four weeks to ascend the mountain. 1896-1902 Surveys by Robert Muldrow, George Eldridge, Alfred Brooks. 1903. First attempt, by Judge James Wickersham. 1906. Frederick Cook falsely claims the first ascent of McKinley. 1910. The Sourdoughs ascend the North Summit. 1912. The Parker-Browne attempt almost reaches the South Summit. 1913. First ascent by Hudson Stuck, Walter Harper, Harry Karstens, Robert Tatum. 1947. Barbara Washburn becomes the first woman to reach the summit as her husband Bradford Washburn becomes the first to summit twice. 1951. First ascent of the West Buttress Route, led by Bradford Washburn. 1954. First ascent of the very long South Buttress Route. 1959. First ascent of the West Rib, now a popular, mildly technical route to the summit. 1961. First ascent of the Cassin Ridge, the best-known technical route on the mountain. This was a major landmark in Alaskan climbing. 1963. Two teams make first ascents of two different routes on the Wickersham Wall. 1967. First winter ascent, via the West Buttress, by Dave Johnston, Art Davidson, and Ray Genet. 1967. Seven members of Joe Wilcox's twelve-man expedition perish in a storm near the summit. Up to this time, this was the third worst disaster in mountaineering history in terms of lives lost. 1970. First solo ascent by Naomi Uemura. 1988. First solo winter ascent with safe return, by Vern Tejas. 1990. Alaskan Norma Jean Saunders became the first woman to officially document a solo ascent of Mount McKinley. She climbed the West Buttress. The Japan Alpine Club installed a meteorological station on a ridge near the summit of Denali at an altitude of 5710 m in 1990. In 1998, this weather station was donated to the International Arctic Research Center at the University of Alaska Fairbanks. In June of 2002, a weather station was placed at the 19,000-foot level. This weather station was designed to transmit data in real-time for use by the climbing public and the science community. Since its establishment, annual upgrades to the equipment have been performed with instrumentation custom built for the extreme weather and altitude conditions. This weather station is one of only two weather stations in the world located above 18,000 feet.